Yesterday, we wrote about Renault’s lovely-looking rebirth of the legendary Alpine A110, the mid-engined Alpine Vision concept. Renault says the car will be sold “across five continents.” Unless they’re counting Antarctica, that sounds like it could include the U.S. But which brand could sell it here? Renault itself has been gone from the U.S. since 1987 when was still partners with lovable losers AMC. That year saw the last sad Alliance sold by a softly-weeping salesman at an AMC dealership. Renault does sort of have a presence in the U.S., though, because Renault and Nissan are part of the same big happy Franco-Japanese alliance. There’s already different at least some market twinsies, like the Nissan Juke and Renault Captur, for example. Alpine is already set to be a semi-separate performance division of Renault, so it’s possible the car could come here, looking just like it does everywhere else, as an Alpine. This would be similar to how Fiat is bringing the Alfa Romeo 4C to the US, re-introducing the brand here for (at least for now) that one car. Maybe they’ll just have Alpine sub-dealers at Nissan or Infiniti dealerships? Of course, they could decide they’d rather keep things in the Nissan family, like they do now for a number of Nissans built on joint Nissan-Renault platforms. Besides, Nissan could use a new mid-engined halo sports car that slots in below the legendary GT-R, right? Of course. 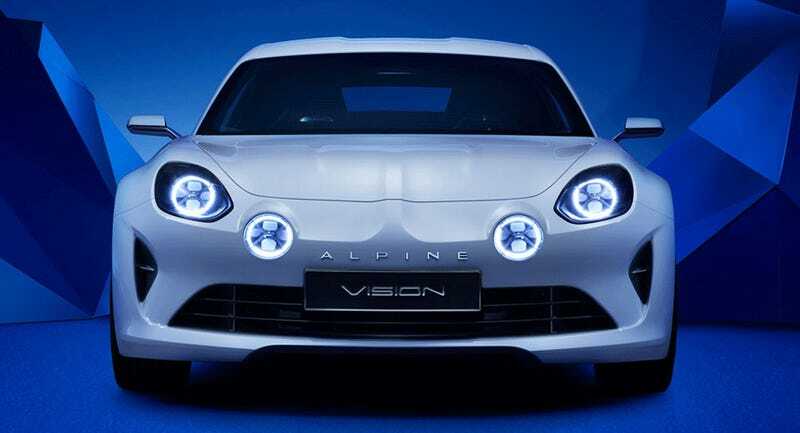 If that happens, I suspect the styling that references the classic Alpine would be scrapped, and Nissan would perform some obscene plastic surgery on the car to give it Nissan’s often-unfortunate corporate mug. I’m not crazy about the way this looks. Well, the way I made it look, at least. I’m sure an actual car designer could do at least somewhat better. I think they could call it the MID5, in reference to their MID4 concept car, and Nissan’s only real foray into mid-enginedom outside the Kei car arena. Someone at Nissan will probably think that the Alpine is just too high-class for the Versa-slinging Nissan, though. If that’s the case, they may want the Alpine to liven up Infiniti’s model range, which doesn’t really have a true sportscar as it is. The agile mid-engined Porsche Cayman-fighter would be just the thing. Naturally, Infiniti wouldn’t have spent all that R&D money developing a truly world-class ugly stick (known internally as the Esthetic Worseninizing Wand, or EWW) if they weren’t going to use it, so I’d guess a face transplant to include some hint at their corporate grille and long, angry headlights would be expected. For naming, I think they’d work with Infiniti’s Q-based scheme, and hint at the cars origin by calling it the QA110. Here’s the wildcard. Maybe, just maybe, someone at Renault will find that a return to the U.S.—even in this limited way—brings up so many fond memories of the AMC era that they’ll want to honor that. And the best way to do that is by calling the Alpine the AMX4. The AMX was AMC’s muscle car and there’s no denying they were cool machines. In fact, there’s even a bit of a technical tie-in to the new Alpine, in that a stillborn AMX/3 prototype was mid-engined, and it was really quite fantastic. By calling the Alpine the AMX/4 and giving it a retro, distinctively AMX face, Renault could capture a vast (estimated) untapped market of frustrated AMX/3 fans who have been waiting, waiting for decades, for a chance to finally own a mid-engined AMX. That has to be a huge market there, right? Of course it is. If anyone at Renault wants my input, you know how to get ahold of me. I can save you some time, though, and just tell you to do the AMX thing. Trust me on this—I’m an American.